The Board also undertakes other planned maintenance operations such as slip repairs, pipeline inspections, culvert cleansing, repairs and renewals. Please check out our Work Programmes webpage for a comprehensive list of planned maintenance works. We recognise that our watercourses and coastal defences are not just Engineering Structures but are also Wildlife Corridors. As such we seek to ensure that important wildlife and their habitats are not endangered by our operations, or during periods of flooding or drought. The Board’s Biodiversity Action Plan, Biosecurity and Standard Maintenance Operations (SMO) policy documents clearly set out how we intend to achieve this. The SMO policy document has been based on the Drainage Channel Biodiversity Manual produced by ADA and Natural England in 2008, and, has since been reviewed to take account of the Water Framework Directive as set out in the Channel Management Handbook and Good Ecological Potential in Fenland Waterbodies Handbook produced more recently by ADA and the Environment Agency. The SMO has been approved by Natural England and is both ISO 9001 and 14001 quality assured. We also seek to reduce our carbon footprint by undertaking work in the most carbon efficient and sustainable manner. We may also need to undertake other improvement work to facilitate development as and when required, in accordance with the Board’s Planning and Byelaw Policy. The condition of our drainage infrastructure is periodically assessed by trained Asset Surveyors to ensure that it remains fit for purpose and meets today’s health and safety requirements. The results of our visual asset inspections inform the planned maintenance and capital works programmes for future years. Much of our Drainage Infrastructure is at the end of its economic life and needs replacing or extensively refurbishing. Whilst the necessary improvements are now scheduled in the capital programme, if the infrastructure fails before we can do the work, we must be able to respond immediately and make the necessary repairs. 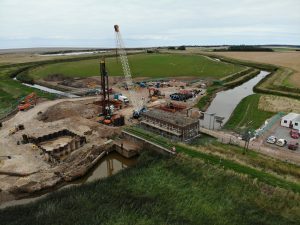 We’re able to undertake rechargeable work on behalf of riparian owners, flood and coastal erosion risk management authorities and other third parties. 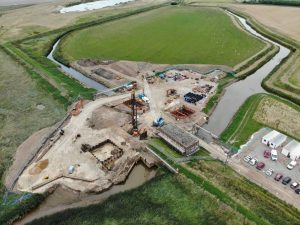 We’re also able to undertake out of hours emergency work and have access to a robust and experienced team to implement a variety of emergency flood, drainage and civil engineering response tasks. Whilst our hourly charge-out rates are competitive they may not always be the lowest. However our price for doing the job is still likely to be competitive because we’re able to complete the work more quickly than most, with minimal supervision, and, without causing any damage on-site. This is achieved by only ever using experienced operatives and having access to robust technical support and the most appropriate equipment for doing the job. If you would like us to quote for some work please contact either the Operations Manager or any one of our Technical Support team, who will be pleased to give you a fixed price for the job. We respond to emergencies during periods of high rainfall and during tidal surge events, utilising our workforce, Board membership and state of the art telemetry system. We work closely with other operating authorities and have detailed how we shall respond in an emergency situation on our Emergencies webpage. We have to contend with an increasing amount of fly-tipping, which is blighting our landscape, costly to manage and bad for the natural environment. It is becoming the ‘new crop’ in and around King’s Lynn. We are working with the Councils and the Environment Agency to collectively help tackle the problem, in accordance with our Fly Tipping Policy.